Instant Calculator for Fahrenheit to Celsius Conversion. Hi Friends! Hope you are doing well. The above table shows Fahrenheit to Celsius Converter where you can put any value in Fahrenheit that will consequently convert it to Celsius. Both Fahrenheit and Celsius are termed as units of temperature used as per technical needs and requirements. Following formula relate Fahrenheit and Celsius. Follow table shows the basic conversion of some common values mainly used in studies. The concept of these two units widely used for temperature can be easily apprehended by the concept of Oranges and Apples. Both come with different composition and taste but fall under the same category……Fruits. Similarly, both temperature scales are somehow related to the freezing and boiling point of waters. But their inception was something different from the basis they are used by now. Fahrenheit is widely used for the measuring of body temperature while Celsius is closely related to defining the nature of water. These temperature units don’t use a common share point and require some offset to be added in the given value before making them applicable for any experiment. Most of the countries have abandoned the usage of Fahrenheit scale and switched to Celsius except America – that is still relying on Fahrenheit scale. Fahrenheit, denoted by F, is defined as a temperature at which water freezes at 32 F and boils at 212 F. These boiling and freezing point values are equally separated by 180 points. Fahrenheit and Celsius are closely related and, more often than not, are defined in relation with each other where zero Celsius is equal to 32 F. It is important to note that, all these values are measured and calculated at sea level with standard atmospheric pressure. Fahrenheit is a term coined by German physicist Daniel Gabriel Fahrenheit in 1724. He proposed the scale based on the ice-salt mixture where he defined 30 F as the freezing point of water, terming 90 F as the body temperature. 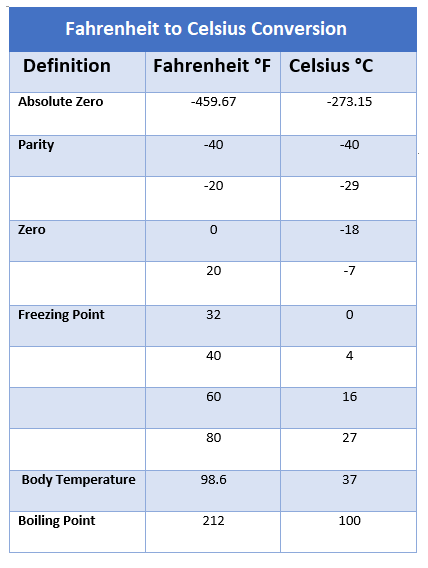 Later, he found, based on a couple of experiment, the freezing point of water is 32 F while the body temperature is 96 F.
When the freezing and boiling point came to limelight as a fixed reference for a thermometer, these values were modified, terming 98 F as the normal body temperature of the human body. The Celsius temperature, denoted by ºC, is defined in terms of Kelvin temperature where -273.15 Celsius is equal to 0 Kelvin – the point mostly known as Absolute Zero. Celsius was the term introduced by Swedish Astronomer Anders Celsius in 1742. Celsius is the SI unit of temperature and is widely replaced Fahrenheit in most of the cases. It is also defined as the temperature at which water freezes at 0 C and boils at 100 C.
Once this threshold, is set for the freezing point of water, the next 100 points in Celsius scale are equal to values in Kelvin. That’s all for today. I hope you have found this Fahrenheit to Celsius Converter useful. If you are unsure or have any question you can ask me in the comment section below. I’d love to help you in any way I can. Thanks for reading the article.